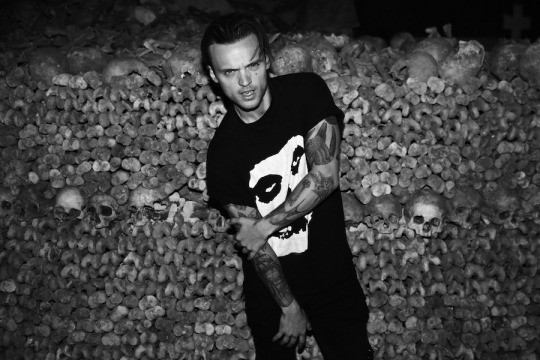 You may know Alex DeLeon as the front man for The Cab, but he’s recently released new solo music under the alias Bohnes. He dropped a new single in September, a track that is powerfully stirring in both its lyrical and sonic content called “Six Feet Under.” The single certainly pulls from his previous alt-rock identity while exploring new elements and production that is uniquely Bohnes. Even more striking, DeLeon has just dropped an acoustic version for the single that elevates the emotion behind the song to new heights, and we have your first look at the accompanying music video. “Six Feet Under” is about fighting to resurrect a lost love, DeLeon singing in the chorus, “Our love is six feet under/Yeah it makes me wonder/We could resurrect it tonight.” The new music video opens with the scene of a casket, upon which sit two skull masks that Bohnes and his lover were wearing in the original music video. However, while the original video focuses on the two of them together, she is not present in this new version. DeLeon is seen singing passionately in an abandoned car accompanied only by an acoustic guitar. Close ups of both DeLeon and the various items symbolizing death focus on the darkness of the song in comparison to the original music video. The clothes he wears and the masks that are present in the original create a seamless connection between the two, but the much gloomier setting stresses the sonic differences. DeLeon’s voice adopts a softer tone in comparison to the more aggressive original that matches perfectly with the minimal instrumentation and emotional quality of the acoustic version and music video. October 26, 2018 The stripped down version is still just as light as the original, but showcases the artist’s talents on a more relatable level.